venezia blog: Venetians Take to the Streets to Declare "Voglio Vivere a Venezia"
Venetians Take to the Streets to Declare "Voglio Vivere a Venezia"
Today, on the same day that UNESCO holds its annual meeting in Krakow, and on the second anniversary of Luigi Brugnaro's taking power as mayor of Venice, thousands of Venetian residents gathered in front of the Arsenale and marched up the Riva degli Schiavoni to remind the former organization that the city from which it recently delayed (for another two years) its threat to place it on its List of Endangered World Heritage sites is still under siege from uncontrolled tourism and reckless development, and to remind the latter politician merely that they continue to exist. 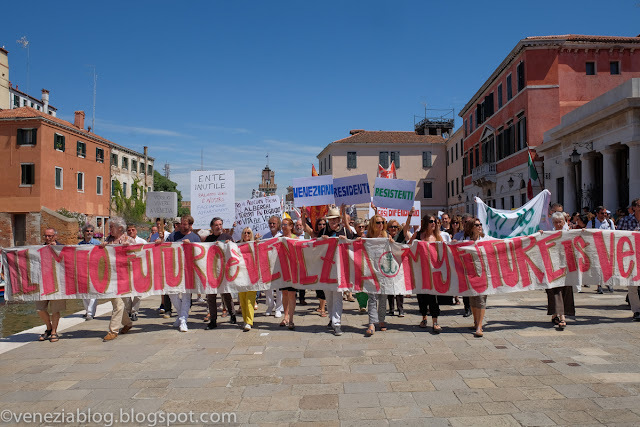 That thousands of Venetian residents periodically feel compelled to take to the streets in order to remind what is called the city's "first citizen" of their existence gives you a fairly good idea of how little attention they feel the mayor pays to the city's inhabitants. After a previous such march the mayor declared that he himself would be "at the head of the next one," thereby overlooking the rather significant point that he'd have no place in a march of the city's residents as he is not, in fact, a resident of the city, nor even the province. In any case, in spite of his prior vow, he was nowhere to be seen at today's manifestazione, entitled "Voglio vivere a Venezia". The city's actual residents seem to hold very little interest for him; it's the commercial possibilities of the city's "brand" (a word he's fond of using) that he focuses on and, contrary to what he sometimes suggests, the latter rarely seem to benefit the latter. 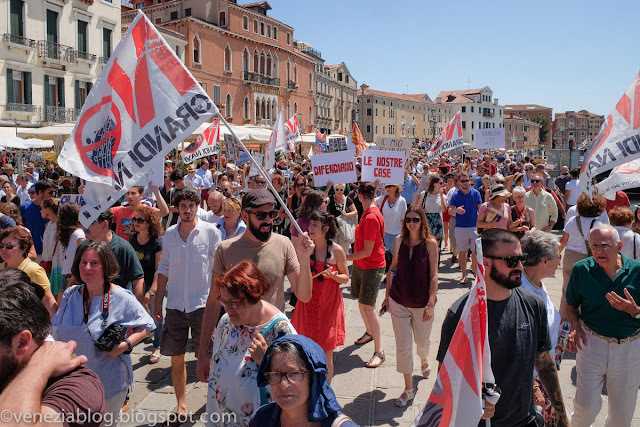 A succinct overview of the concerns that motivated the march is provided in today's edition of La Stampa. What struck me most about the march was how odd it is to see residents outnumbering tourists in the streets. 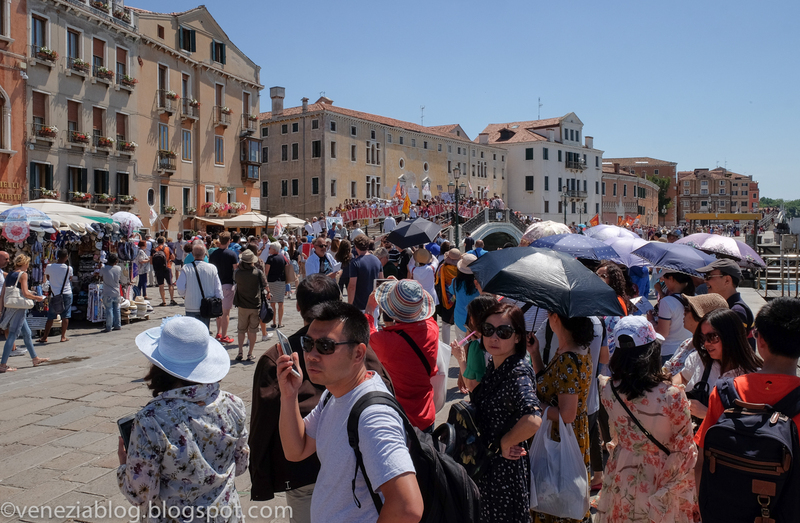 And those tourists lucky enough to be in town today truly had a rare experience here--the kind of rare Venetian experience so many tourists hope for, and are promised by various travel agencies or guides or publicity materials. In a small zone of city, for a short time, these tourists weren't just surrounded exclusively by other tourists. 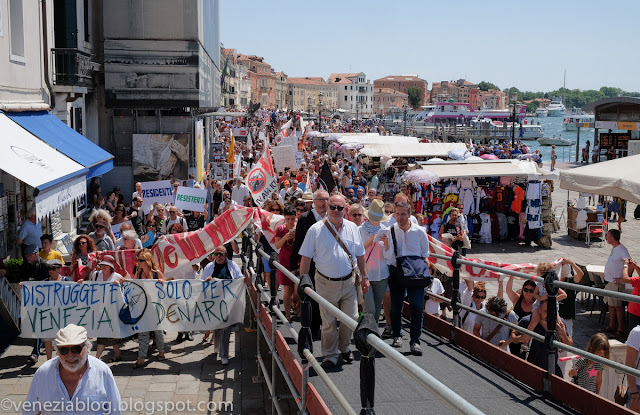 There was local life, loud and boisterous, right before their eyes, filling the riva! This kind of ratio of residents to tourists in the streets is almost never encountered in most places in the city. But based upon the remarks I overheard, most of these visiting fortunate few were nonplussed, at best. 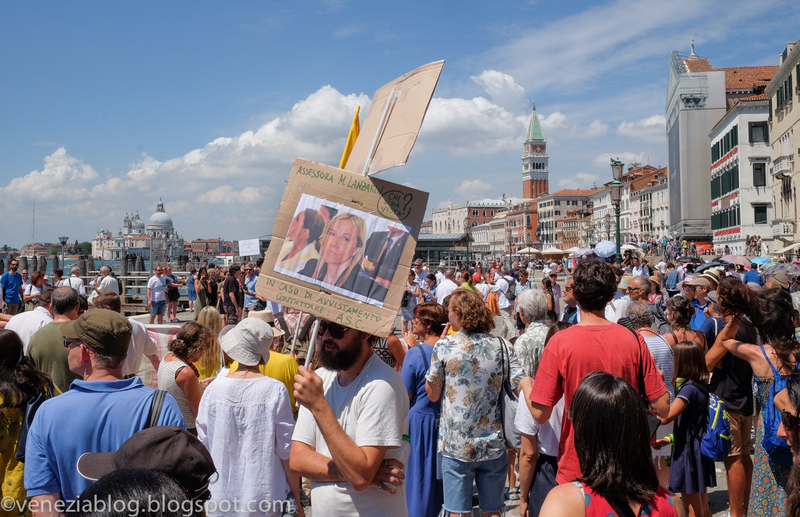 "Oh, no, no, that's not possible," one young man said to his his two companions, as they walked up beside me and he saw the crowd spread across the riva and filling the bridge (and beyond) ahead of him. He put his hand to his head, as if a headache was coming on, and said, "Great! Now where do we go?" This is the kind of question, and sight, and headache, that every resident of Venice knows all too well. 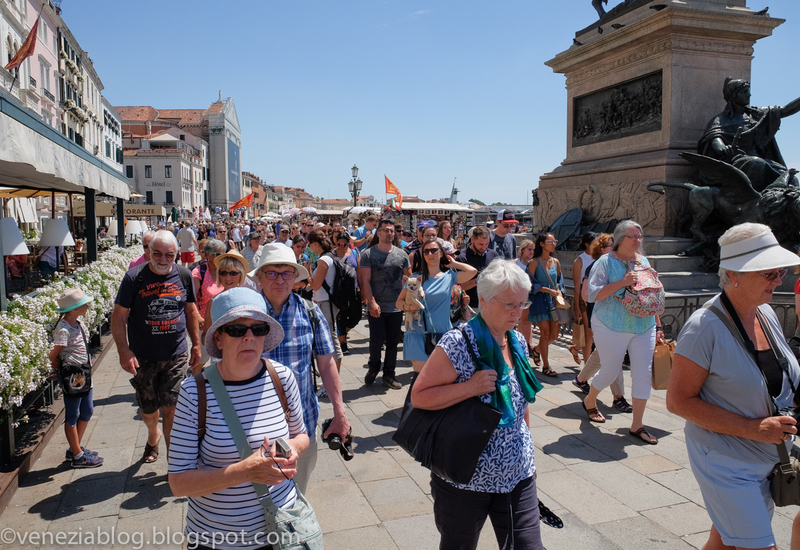 Except in the case of residents, the path ahead of us is always blocked by a truly astonishing number of tourists, marching (or, more often, trudging) behind their own upraised standard (usually a small flag or umbrella held by a tour guide). How pleasant it was, just for a short hour or so, to witness the situation reversed. But of course it couldn't last. 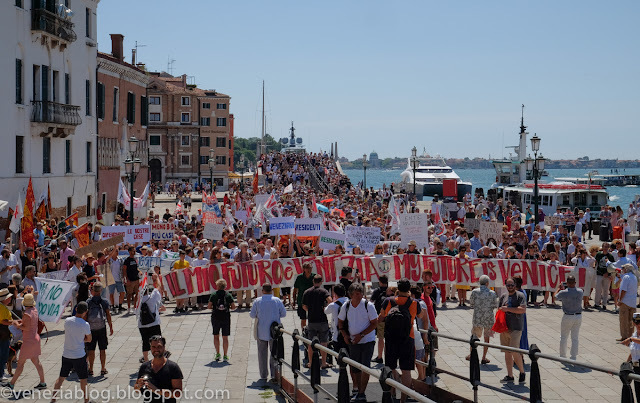 As the marchers got nearer to Piazza San Marco, the crowds of tourists disgorged onto the riva by the large launches that ferry them from various places around the lagoon to the historic center began to rival the number of residents. And had the march continued into Piazza San Marco itself, residents might very well have found themselves surrounded by an occupying force of equal or greater number. But the march stopped a couple of bridges short of the Piazza--which hasn't been a place for residents for about half a century. 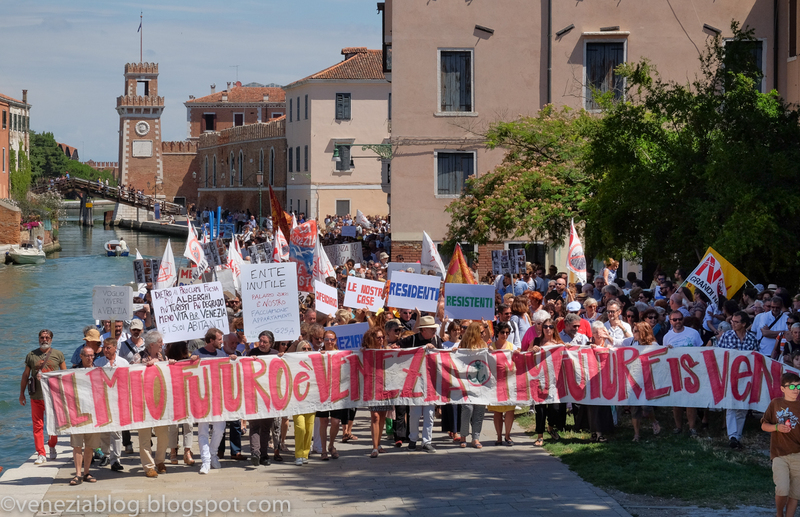 It's great to see Venetians on the march for their city! Even if I nourish a dream to one day own a place in Venice I still want it to remain a living city. 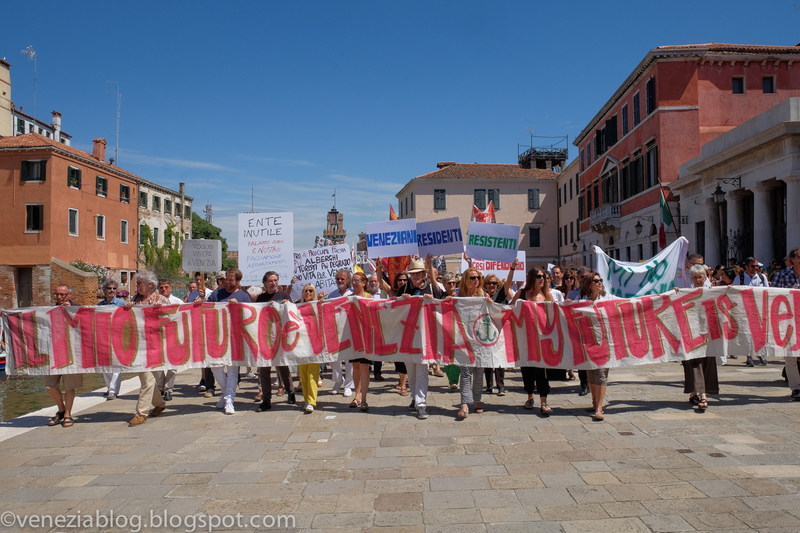 As a tourist in Venice a couple of times a year, I admire what Venetians are doing. We try to spend in the right parts of Venice, and have loved the place for years, and always feel a little guilty to be there .... but we feel that the mass landings from the Cruise ships are the most cruel to the city. Well done them, they have my full support. Bucket List Alert! Now YOU Can Tube Down the Grand Canal! 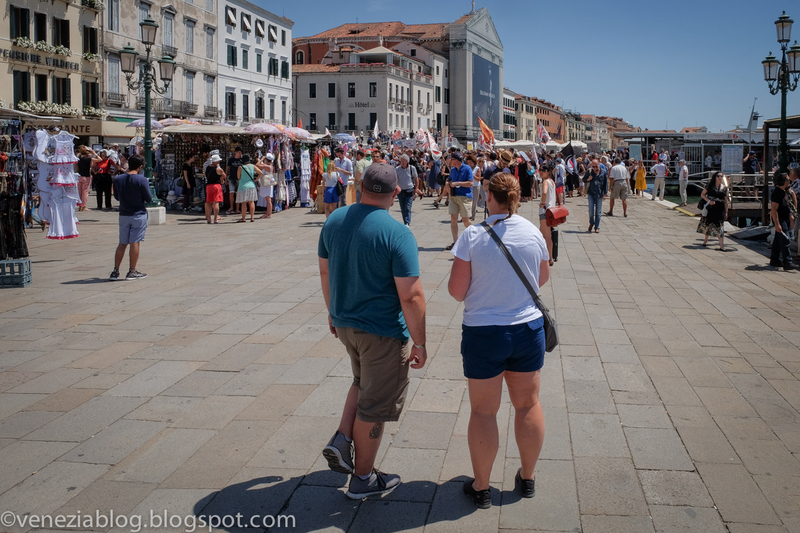 In November 2010 my wife, our 3-year-old son, and I moved from Brooklyn, NY to Venice, Italy. Born and raised in California, I'd lived in NYC since 1993--except for a 2 year period from 2007-09 when my wife and I lived in Asheville, NC, where our son was born. I have dual American-Italian citizenship and am equally divided between Sicilian blood on my mother's side and Genovese on my father's. I've published a novel with a major press, some journalism, and worked a variety of jobs. Венеция в Севилье - Рафаэль Ceнет. Канал в Венеции. 1885. Музей изыщных искусств, Севилья.Rafael Senet. Canal de Venecia. 1885. Museo de Bellas Artes de Sevilla.